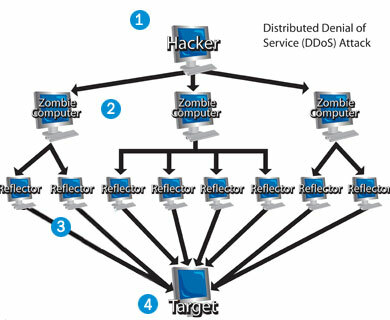 Although you cannot “technically” stop a DDoS attack, there are ways to detect and automatically mitigate the debilitating effects on your public facing servers. Below, we shed some light on how to accomplish this without spending hundreds of thousands of dollars on a full service security solution that may be overkill for this situation. We assume in our recipe below, that you have some sort of firewall device on your edge that can actually count hits into your network from an outside IP, and also that you can program this device to take blocking action automatically. Note: We provide this type of service with our NetGladiator line. As of our 8.2 software update, we also provide this in our NetEqualizer line of products. Calculate your base-line incoming activity. This should be a running average of unique hits per minute or perhaps per second. The important thing is that you have an idea of what is normal. Remember we are only concerned with Un-initiated hits into your network, meaning outside clients that contact you without being contacted first. Once you have your base hit rate of incoming queries, then set a flag to take action ( step 3 below), should this hit rate exceed more than 1.5 standard deviations above your base line. In other words if your hit rate jumps by statistically large amount compared to your base line for no apparent reason i.e .you did not mail out a newsletter. You are at step 3 because you have noticed a much larger than average hit rate of un-initiated requested into your web site. Now you need to look for a hit count by external IP. We assume that the average human will only generate at most a hit every 10 seconds or so, maybe higher. And also on average they will like not generate more than 5 or 6 hits over a period of a few minutes. Where as a hijacked client attacking your site as part of a DDOS attack is likely to hit you at a much higher rate. Identify these incoming IP’s and go to Step 4. Block these IP’s on your firewall for a period of 24 hours. You don’t want to block them permanently because it is likely they are just hijacked clients ,and also if they are coming from behind a Nat’d community ( like a University) you will be blocking a larger number of users who had nothing to do with the attack. If you follow these steps you should have a nice pro-active watch-dog on your firewall to mitigate the effects of any DDoS attack. For further consulting on DDoS or other security related issues feel free to contact us at admin@apconnections.net.